Back in stock. New photos coming soon. 4ms RCD's Back in Stock! The audio quality is a bit harsh, but Blues Saraceno's amazing talent shines through on this video from the Big City Music booth at NAMM 2010. Blues is playing a MusicMan guitar through a pair of Dirty Boy pedals, the "Fuzzy Boy" and "Rude Boy." 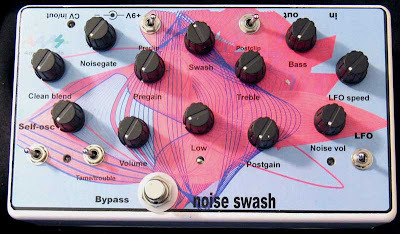 These are great, great pedals! 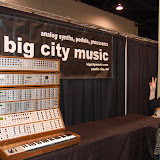 Here is a very quick demo of the Dewanatron Swarmatron being shown at the Big City Music booth at NAMM 2010. These eight oscillators can be played with a single ribbon controller (variable resistor) to move the pitch center up or down. The span control expands the sound of a swarm of eight notes spread just a few cents apart into a wide chord of equidistant pitches spread over the entire spectrum. The player can "taffy pull" the resulting chord by using the span control and pitch ribbon in tandem. Swarms of sine waves evoke swarms of angels congregating. 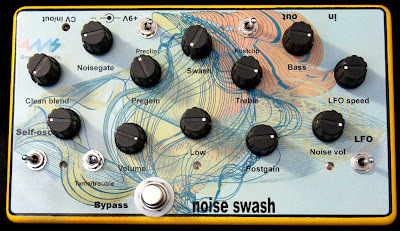 Swarms of sawtooth waves evoke the swarming of bees. The sound of a host of voices, earthly or unearthly, has a unique character recognized by the ear even when they are folded together in unison. Here is Eric Barbour (Metasonix) showing his latest creation, the D-1000 vacuum tube drum machine. It's gritty, grungy, grainy, grimy and groovy. Buy one for your mom. She'll totally dig it. Juergen Michaelis demo's his new Jomox MBrane II modeling synth at the BCM booth at NAMM 2010. The MBrane II is a small analog synth optimized for percussive snare drum and cowbell-like sounds with a wide range of sound characteristics. Juergen's new design makes it possible to produce very authentic membrane-like sounds from 2 analog T-Bridge oscillators by means of coupling and dampening. A versatile noise generator with white noise, metal noise and envelope control allows you to created snare drums, rim shots, cow bells and bongos. Dan Green (4ms) explains his new Rotating Clock Divider & Clock Multiplier eurorack module at the Big City Music booth at NAMM 2010. Ahh, the noise, the excitement, the assault on the ears, all that is NAMM! 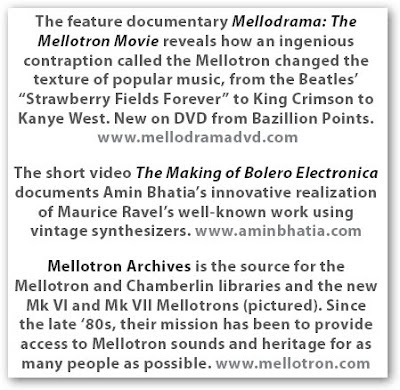 In this video you see Eric Barbour (Metasonix), Wolfgang Michalowicz (Surfin Kangaroo) among others. 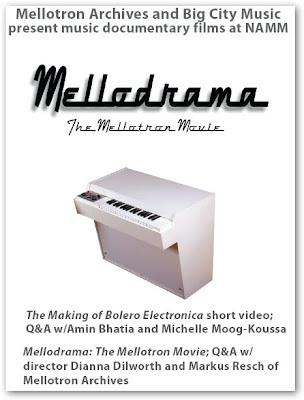 That is the new prototype digital Mellotron on top of the standard Mellotron, massive A.S. System 8500, 4ms goodies, Flight of Harmony Infernal Noise Machine, Sherman Rodec ReStyler, Dewanatron Swarmatron, Diabolical Devices modded & original gear, Ham Heart boxes, Eowave Persephone II, Metasonix D-1000 Tube Drum Machine + Eric's new MIDI to CV and R-54 SuperModule , Signal Arts Tetra MAPS sequencer, Surfin Kangaroo Step Sequencer, Malekko modules, and last but not least, the handmade Dirty Boy pedals from Alex Saraceno! A short video teasing the Surfin Kangaroo Step Sequencer. We're inputting the current sequence with a MIDI keyboard in real time! You can also trigger saved sequences via MIDI. 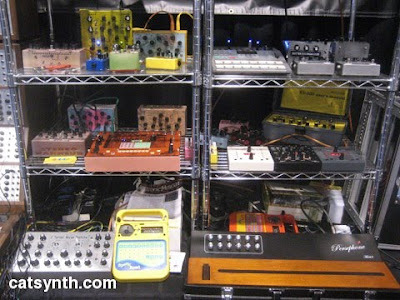 New JoMoX Instrument at NAMM! Come hear it in action at he BCM NAMM booth 6735 Hall A! A T-Bridge oscillator is actually something like a band pass filter which is working close to the resonant frequency. Because it becomes an actual sine oscillator at perfect tune-up, you call the deviation of ideal resonance dampen. In this case, the oscillator decays in form of an attenuated vibration if it's exited - similar to a single membrane that is hit. In the M.Brane 11 there are two of such T-OSC. The dampen can be either negative (as just described) or positive. Then it really becomes a steadily vibrating oscillator. The more negative the dampen is, the more the T-OSC becomes a filter with sharp q-factor (quality). This can be useful at e.g. snare drums or hi hat-ish sounds. Looking at the drumskins of an acoustic drum, there are 2 membranes positioned that modulate and interact with each other by the coupling through pressure waves of the content air. That produces the typical sound of a drum. By resonance and counteractive interference new frequency bands and overtones create. Similar to that the parameter Coupling works at the M.Brane11. Both, in the first place independently vibrating T-OSCs, can attenuate or gain the vibration of the partner by means of negative or positive coupling on either ways (1_2 and 2_1). With lightfingered tweaking you get these interesting membran-like dampened sounds, especially by cross-wise positive/negative coupling. 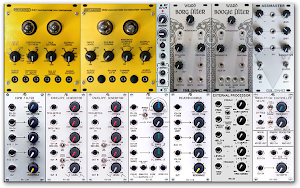 The M.Brane is definitely something for sound nerds - less for preset-twiddlers, as the manifold and sensitive modulation settings want to be explored and played with.Analog Membrane Modeling. Two analog T-bridge oscillators become electronic membranes. Why? Because they can be coupled. And because their dampening can be controlled. Then add a little noise, add a little envelope, and the brand new electronic percussion synthesizer of Jomox is ready. But because this would have just been too simple, everything is storeable again and controllable by Midi. You can use this small box either in a live setup driven by a hardware sequencer or in a production as very versatile synth in order to create incredible analog electronic percussions. In Split Mode 2 both the T-OSCs can be played over the keyboard, which again causes creativity to rise. The LFO can either modulate a choice of one T-OSC or both. It always restarts with the note trigger and works like an additional pitch envelope. Two frequently asked questions may be pre-answered here: No, the LFO can not be midi clock syncronized, and: No, the LFO isn't very fast. Both things would absolutely make no sense in this product (percussion!) and are also for technical reasons not possible to realize. 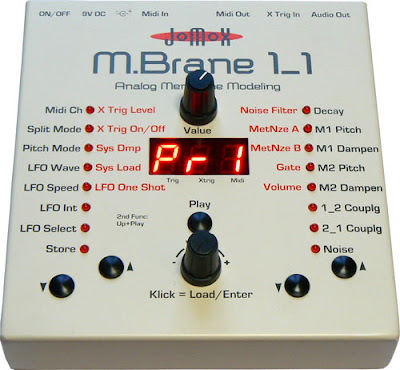 In order to create snaredrum-like sounds, the M.Brane has a noise generator with an own envelope. A part of this signal is fed into the T-OSC to exite the "membrane" with the noise signal. The noise can be wether white noise or metal noise. Blues Saraceno rocking Dirty Boy Pedals at the 2009 NAMM Show BCM booth. Blues will be back this year playing in Hall A, booth #6735.